"We trust the software completely for running our machines. At night, we operate a 'lights-out-shift' in which the machines continue to operate without supervision." 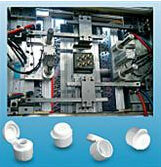 Cimatron Integrated Mold making solution, including part design, mold design, electrodes, and full NC capabilities. WIRO is a family owned toolshop with 40 employees in Olpe, Germany. The toolshop produces molds for screw caps, closures and tube components. 90% of their tools are exported, with 80% of orders shipping outside of Europe. WIRO customers include the biggest multinational companies in the food and cosmetic sectors. WIRO are involved in their customers' work from consulting on the design of the part to coordinating injection molding at the customer's site. Wiro is two time winner of the Mold maker of the year award at Germany's Excellence in tooling ceremony. WIRO won the award in 2006, and in 2008. The company did not compete in 2007 or 2009 because the winner is asked to bow out of the competition in the year immediately following a win.